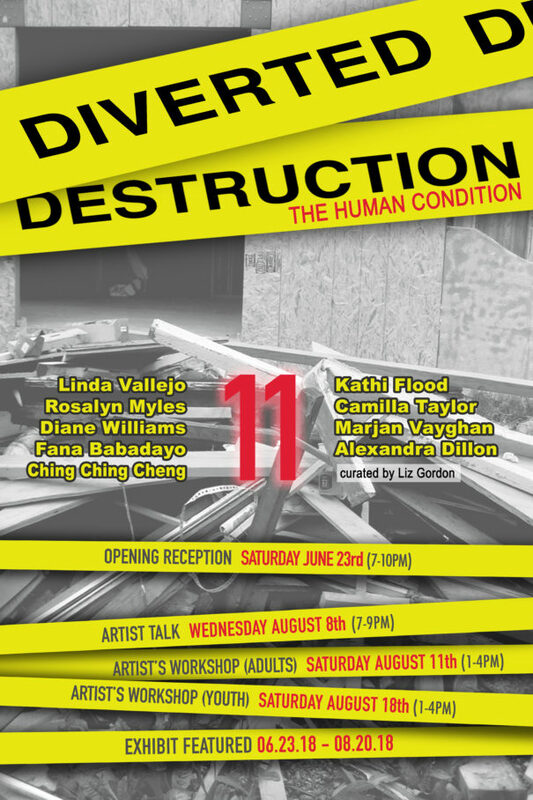 Diverted Destruction is an annual exhibition featuring works comprised of found objects, discarded and repurposed trash items which would otherwise be bound for landfill. In addition a “found-object” giveaway installation by curator Liz Gordon is included as part of the show’s opening night happenings. Beyond its continued ecological theme, our 11th annual show will include a subtext as our 9 featured women artists explore the human condition through their work. Fana Babadayo, Ching Ching Cheng, Alexandra Dillon, Kathi Flood, Rosalyn Myles, Camilla Taylor, Linda Vallejo, Marjan Vayghan and Diane Williams.